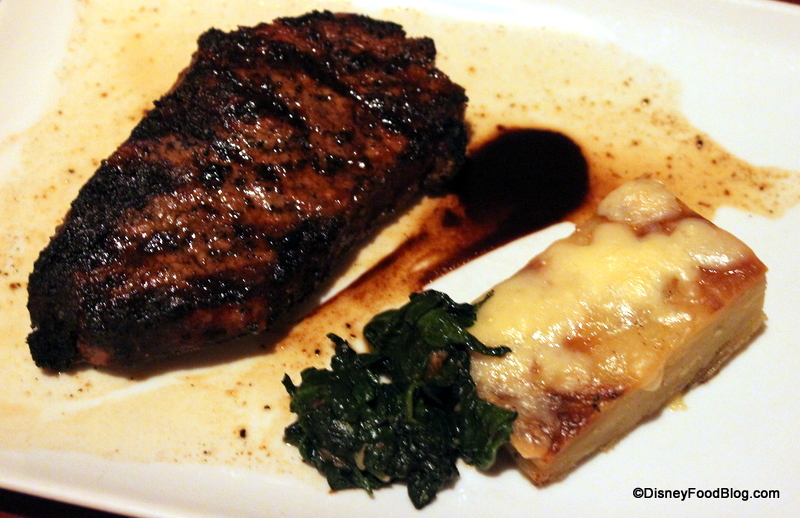 Recently, I was pleasantly surprised by the Flame Broiled New York Strip here. The tasty cut was tender and topped with an incredible Blue Cheese Butter! Maybe it’s just the romance of dining in a convertible under faux stars. Nah…it really is fantastic. You knew I’d get to Le Cellier, right? The tiny restaurant located in Epcot’s Canada Pavilion has become increasingly popular and pricey over the last few years. But Le Cellier’s famous Filet has been a must-have menu item in my book for years. 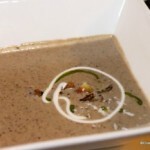 In the past, it has always been served with Mushroom Risotto and Truffle Butter Sauce. 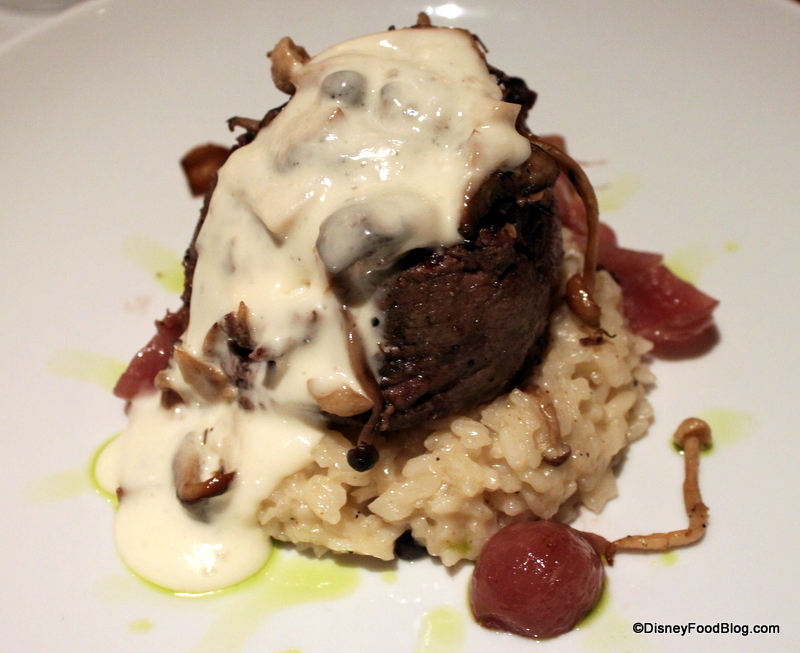 But in keeping with its identity as a Signature Restaurant, Le Cellier has taken to fiddling with the dish. 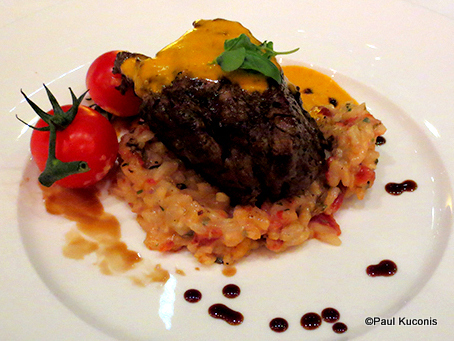 On my recent visit, the Filet was served with Spinach Risotto, Smoked Bacon, and a Parmesan-Butter Sauce. I was prepared to be disappointed — but…it was as good as (if not better than!!) the original! I can’t wait to have it again! If your tastes run to Ribeye, check out their Bone-In version, served with a flavorful Compound Butter. 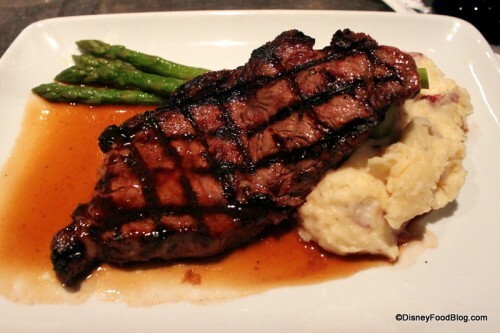 Their Angus New York Strip also wins rave reviews. 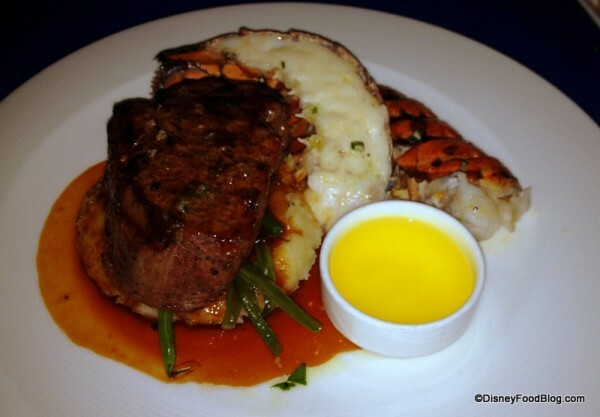 A great steak is just a monorail ride away when you dine at Kona Cafe. Fusion flavors inspired by the Polynesian Islands Asian cuisine bring a special flair to dishes here. 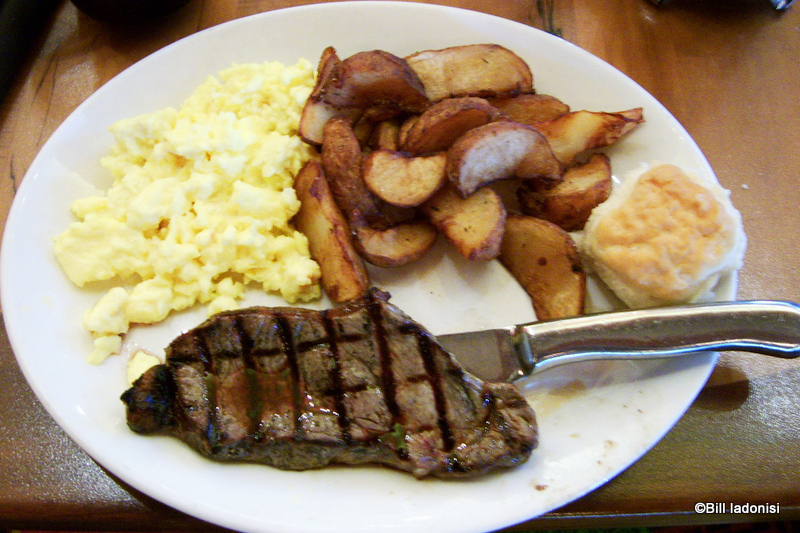 As a bonus, you can have steak for breakfast, lunch, and dinner here if you’d like! Start your day off with one of our favorite morning meals — Steak and Eggs! 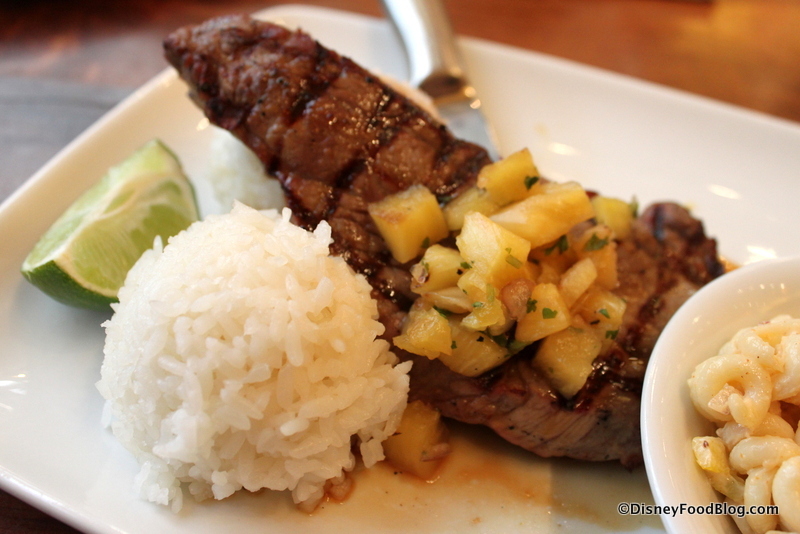 We love the Grilled Teriyaki Steak at lunch, served as part of the Polynesian Plate Lunch with Pineapple Salsa and sides of Sticky Rice and Pasta Salad. 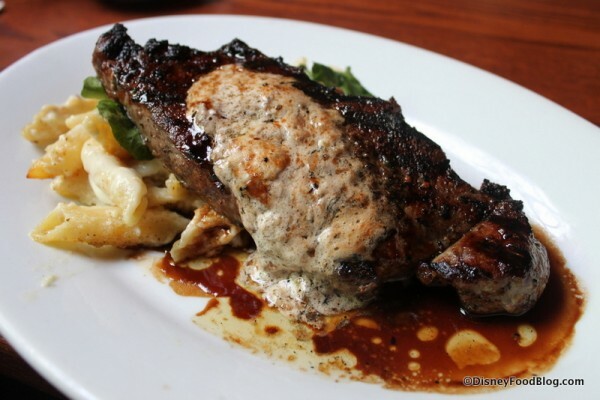 For dinner, they also feature a delicious New York Strip Steak accented with a Molasses Bacon Butter. 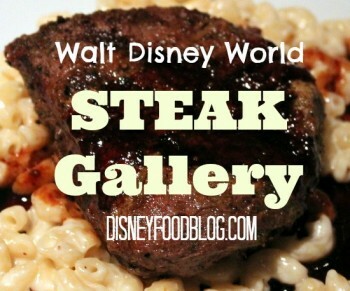 Many folks feel that it’s one of the top steak options in all of Disney! No one can resist a meal in a castle! Dining at Cinderella’s Royal Table in Magic Kingdom’s Cinderella Castle is always at treat. And what better way to mark such an occasion than by enjoying a fine steak? That’s just what I did on my recent visit there. The Beef Tenderloin was served with an amazing Bearnaise Sauce, and accompanied simply by Roasted Potatoes and Asparagus. Deceptively simple, the dish won rave reviews. 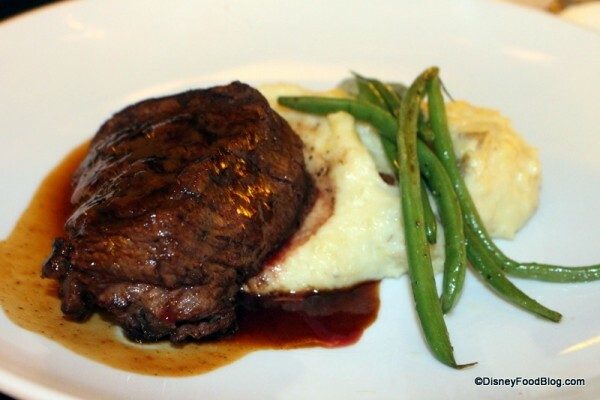 The petite filet was on the small side, but was well cooked and had good flavor. Chefs at Cinderella’s Royal Table like to change things up frequently, though, so you may encounter a different presentation when you visit. 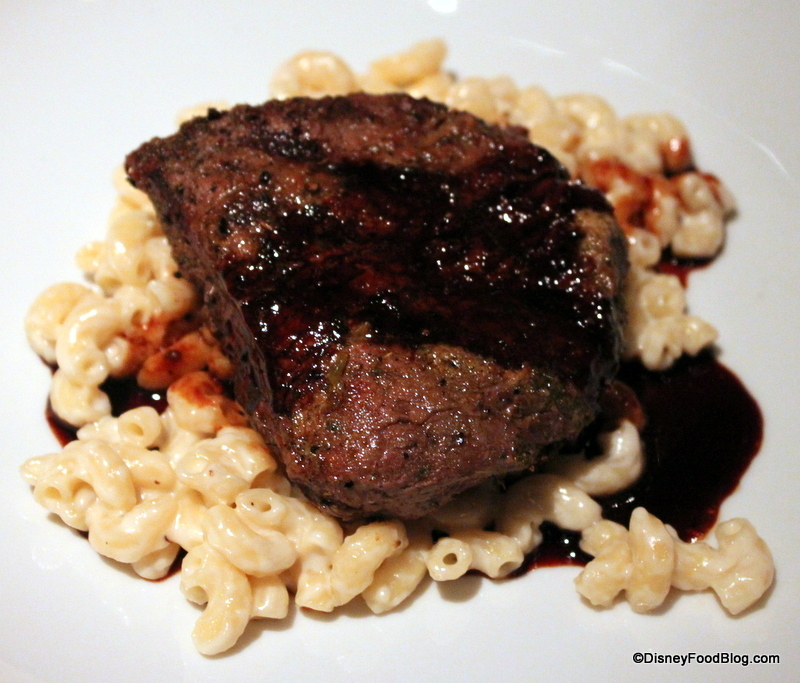 Another moderate restaurant featuring a delicious steak option is The Wave…Of American Flavors at Disney’s Contemporary Resort. The Wave emphasizes farm fresh fare and seasonal ingredients, so you’re likely to see different sides and accompaniments during your visit. But I’ve always enjoyed the Grilled Beef Tenderloin here when I’ve ordered it! While the size is a little smaller than many Disney restaurant servings, I found it to be perfect. Usually, when I dine at Mama Melrose’s Ristorante Italiano in Disney’s Hollywood Studios, I enjoy the Italian specialities that this quaint restaurant is known for. But on a recent visit, I discovered they serve a pretty fantastic steak! 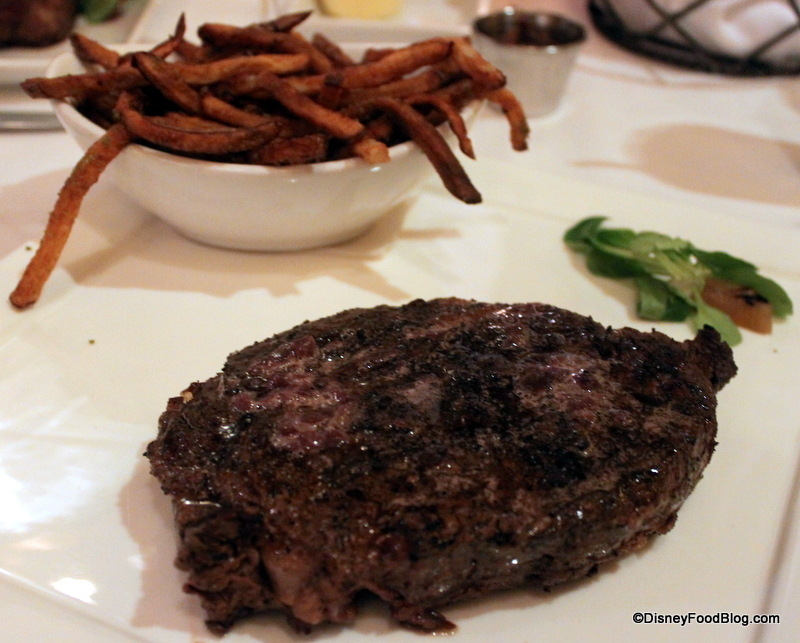 OK, I’ll be honest — this is one of my new favorite steaks in Disney World, hands down. I dream about this thing. And the fact that their Charred Strip Steak is currently served with a baked Five Cheese Macaroni. 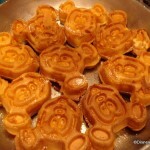 I’m jealous of anyone who gets to eat this. Chances are that you haven’t even heard of Boatwright’s Dining Hall if you haven’t stayed at Port Orleans Riverside. But believe me when I say so: it’s worth the trip just to dine here. 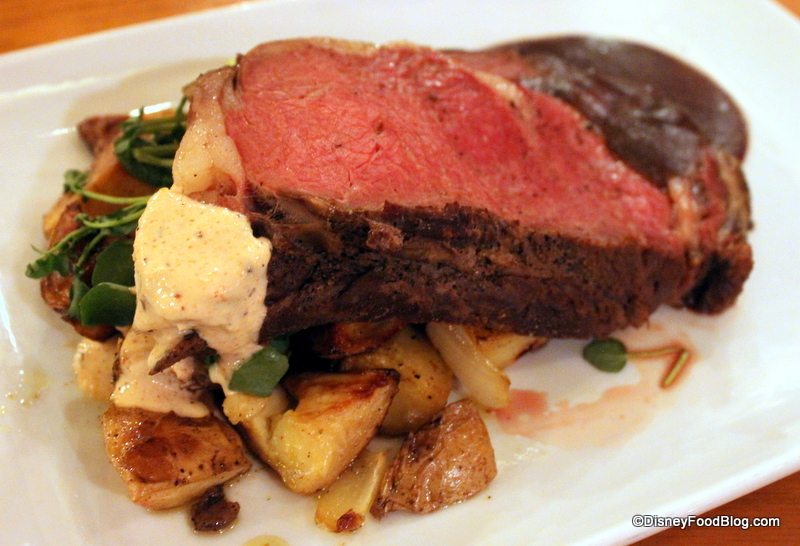 And my very favorite dish among many standout items is the Slow-Roasted Prime Rib. Prime Rib straddles the fence between a roast and a steak. But since I usually find it on classic steakhouse menus, I’m including it! There’s nothing particularly unique about this version. It’s just a quality cut of meat, roasted perfectly, and served with perfect sauces and side dishes. How can you go wrong with roast beef, potatoes, jus, and creamy horseradish? It’s the best we’ve ever had — anywhere, actually. Who doesn’t love a trip to a Japanese steakhouse? 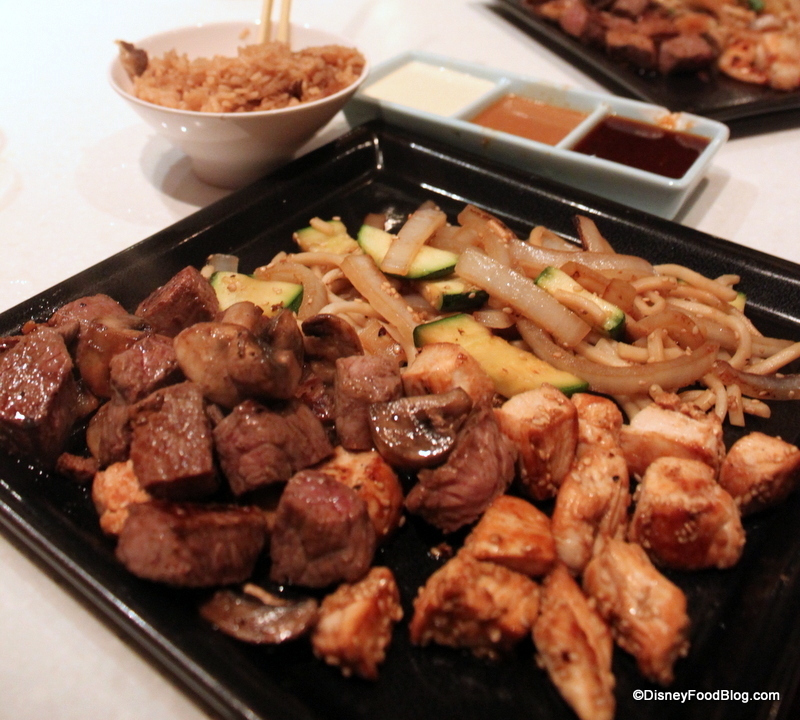 And when you’re actually in Japan — Epcot’s Japan, that is — you can enjoy the teppanyaki experience at Teppan Edo. I enjoyed the Nihonbashi, or Steak and Chicken Combo, the last time I dined here. Asakusa, a combination of Steak and Shrimp, is another red meat option. So good — and it’s always fun to watch the talented hibachi chefs at work! Upgrade to filet to get one of the most tender steaks you’ve ever had. Beef purists can also enjoy Filet Mignon served solo with traditional Rice and Vegetables. Looking for a good date night spot? You’ll love the bright, elegant ambiance of Citricos at Disney’s Grand Floridian Resort and Spa. When we have occasion to dine here, there’s always a fight over who gets to order the steak! 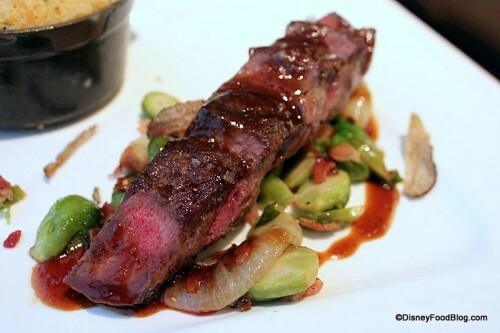 In the past, it’s been an Oak-Grilled Filet of Beef that was so delicious, it led to fork fights. 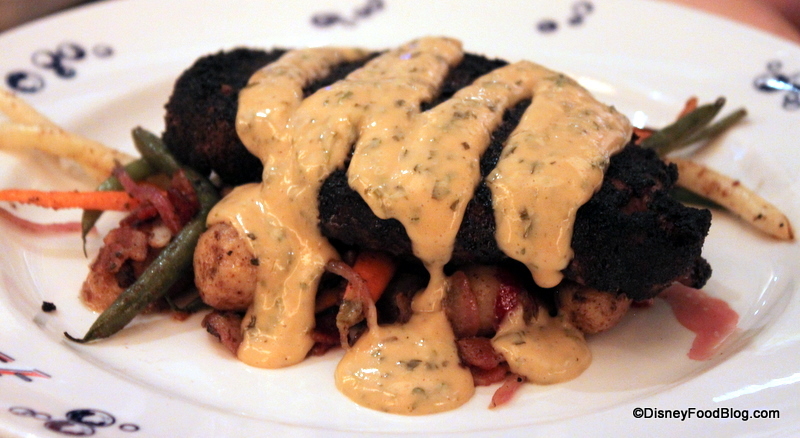 Narcoossee’s at the Grand Floridian is another Disney restaurant well-known for impressive seafood dishes. And the view of Wishes across Seven Seas Lagoon is stunning. But they have a lovely steak option for those among us who aren’t in love with fish. The last time we dined here, my husband and I both ordered the Filet Mignon! It was for the best. This way, we didn’t have to fight over it! Artist Point at Disney’s Wilderness Lodge is well-known for their Cedar-Plank Roasted Salmon and exotic selections, like Buffalo, Venison, and Game Sausage. But they also serve a lovely Grilled Center Cut Filet Mignon. 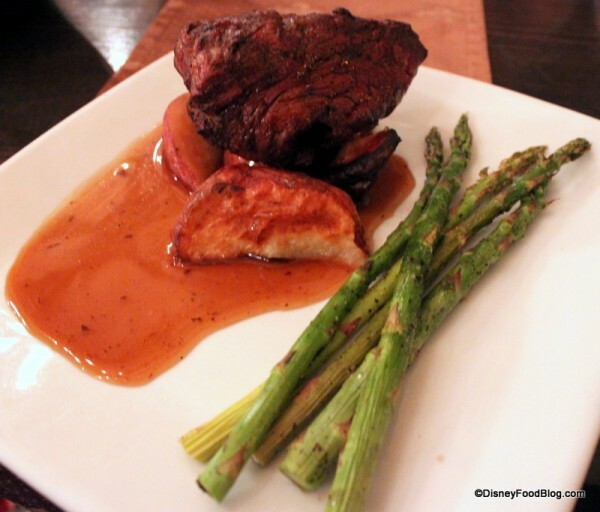 It took me a while to try Hollywood Brown Derby at Disney’s Hollywood Studios. But when I finally did, I was in love instantly! I have enjoyed their Charred-glazed Filet of Beef again and again, especially when they serve it with butter and a big ol french fry on top! We love California Grill at Disney’s Contemporary Resort for its sweeping views. There’s no better place at Disney to take in a sunset — or watch Wishes at Magic Kingdom! Chef Brian Piasecki enjoys changing up sides and sauces, but the Oak-Fired Filet of Beef remains a popular menu favorite. A departure from traditional steak options, guests also love the Seared Bison. 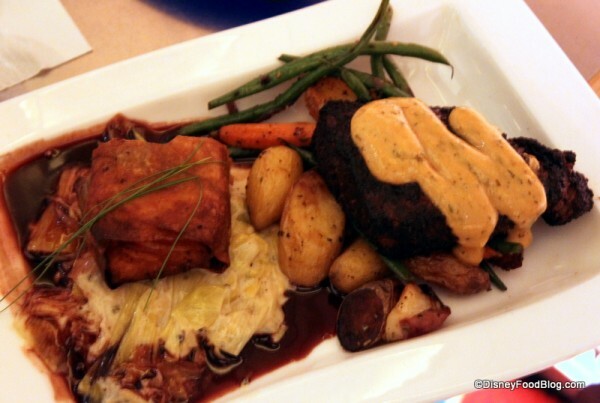 At Monsieur Paul in Epcot’s France Pavilion, you’ll also find Filet Mignon. But this signature dining spot offers its own twist on the tender cut of meat. 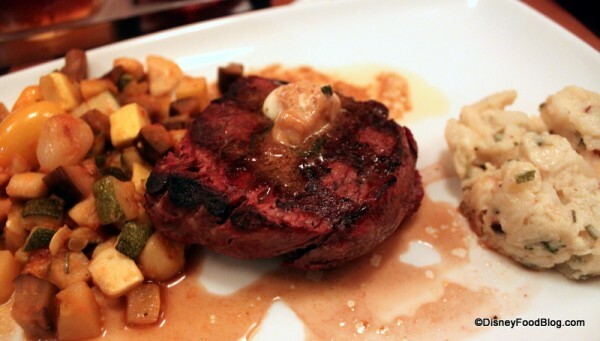 The Filet de Boeuf Grillé Forestier comes topped with a crust made of Pureed Mushrooms. Reminiscent of Pâté in consistency, it distinguishes this dish from other steaks that you’ll find throughout Disney World. We talk so much about the World Showcase restaurants in Epcot that sometimes it’s easy to forget Coral Reef Restaurant in Future World. While fish and seafood are certainly on the menu, lots of folks head here for the Grilled New York Strip Steak. 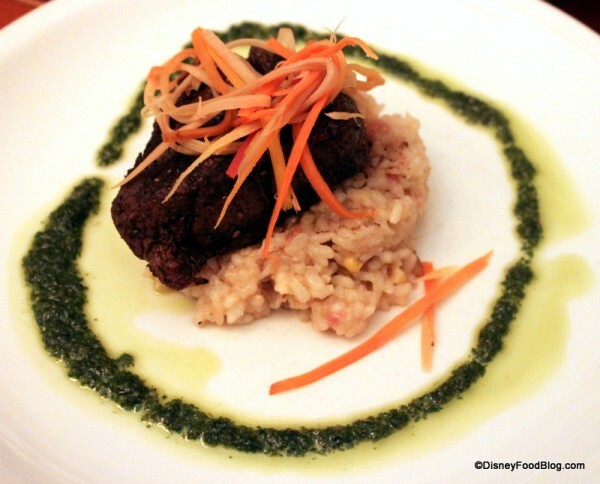 If you enjoy your steak with a bit of Mexican flare for good measure, you might want to check out San Angel Inn Restaurante in Epcot’s Mexico Pavilion. The Carne Asada platter features a New York Strip Steak served with Cheese Enchilada, Black Refried Beans, and Mexican Rice. 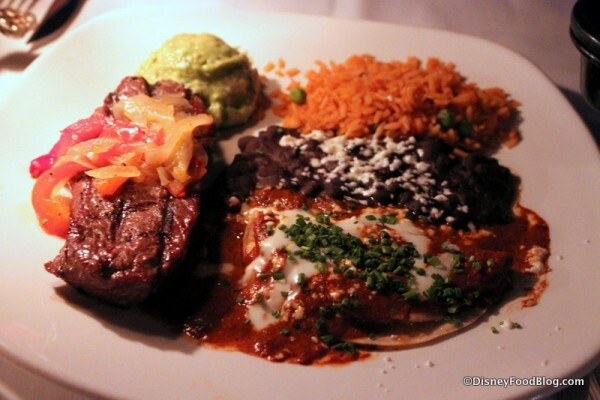 Across the way, La Hacienda de San Angel offers a mixed grill that includes steak as well. 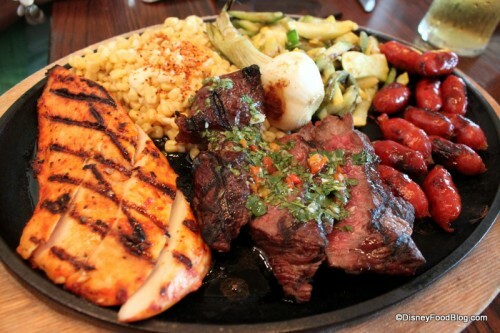 Featuring Sirloin, Chicken, Chorizo and Veggies, La Hacienda Parrillada includes a little something for everyone! 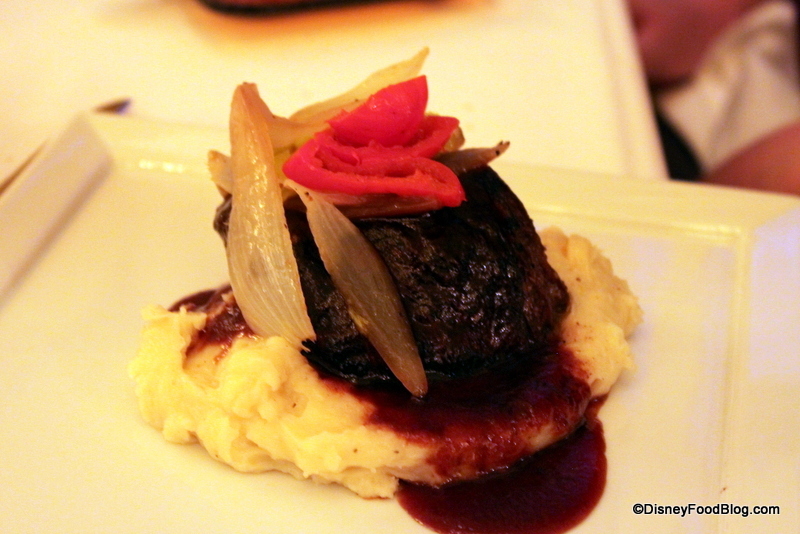 Dinner at Be Our Guest Restaurant in Magic Kingdom’s New Fantasyland is a memorable experience. I mean, how often do you get the chance to dine in an enchanted castle? The Grilled Strip Steak here is one of my favorite menu items! 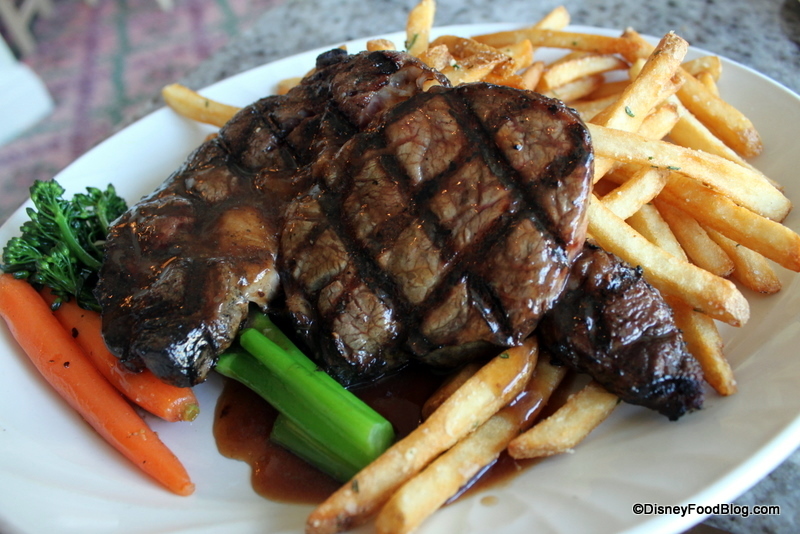 You can find another great steak on the Magic Kingdom Monorail loop at the Grand Floridian Cafe. This is a great option when you don’t have an advance dining reservation, but you’d like to enjoy a relaxing lunch. 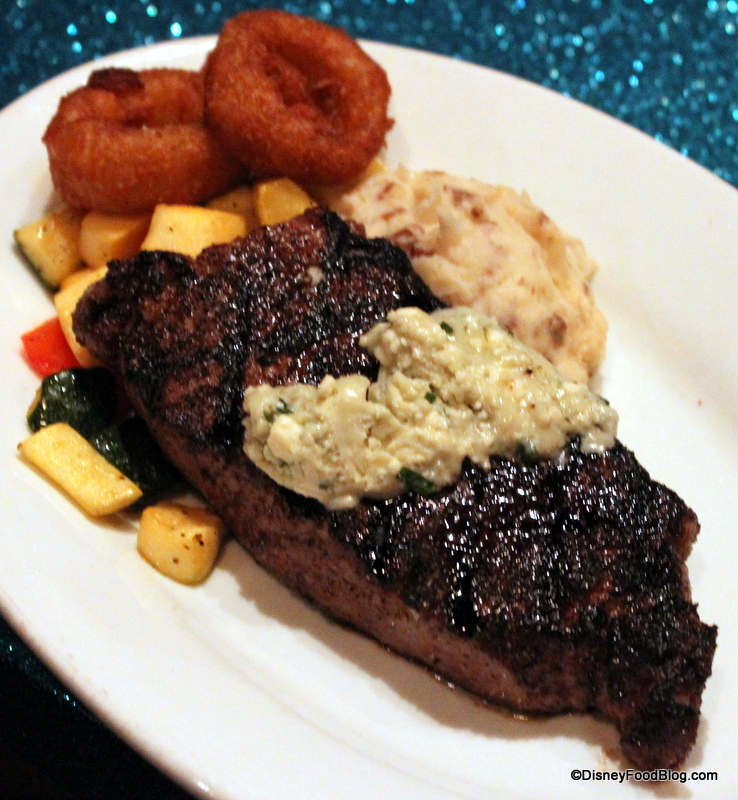 The Char-Crusted New York Strip Steak is the steak du jour right now. 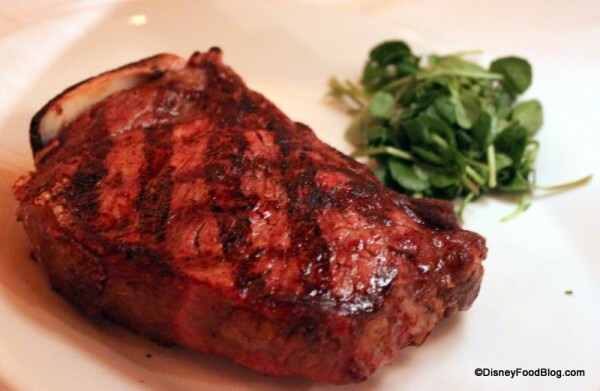 But from time to time, guests may also find this lovely Ribeye on the menu. When last we had it, there was a bit too much sauce for my liking, but it was still fantastic and cooked perfectly. 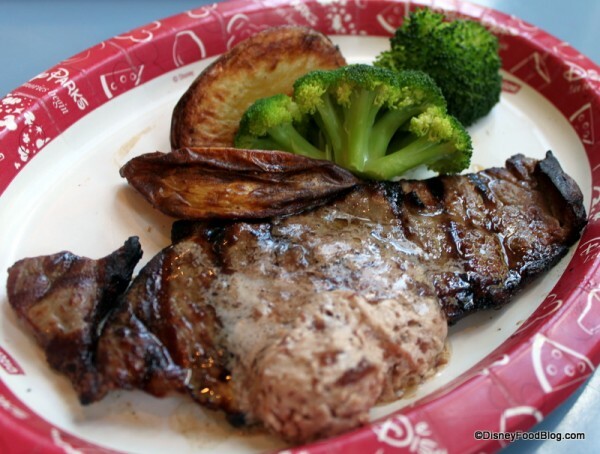 Splitsville Luxury Lanes at Downtown Disney offers steak lovers a couple of fun ways to enjoy their favorite entree. 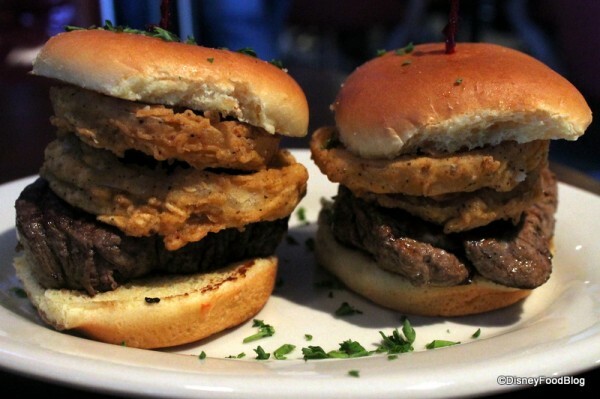 Fans of tenderloin will love the buttery Filet Sliders! 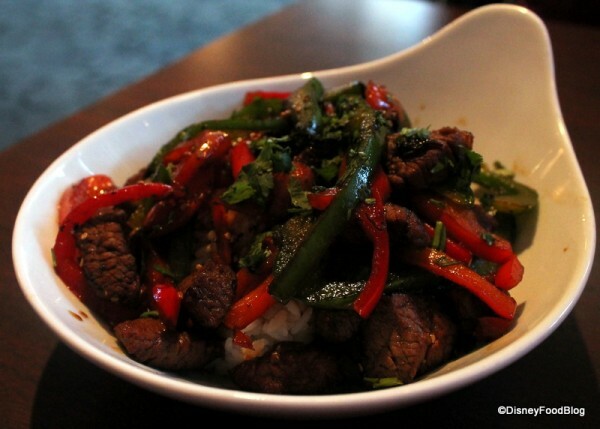 But if you like steak as an accent with other foods, you may want to try the hearty Steak Fajita Rice Bowl. And there you have it! Some of the best steaks that money — or Disney Dining Plan Credits — can buy in Disney World! 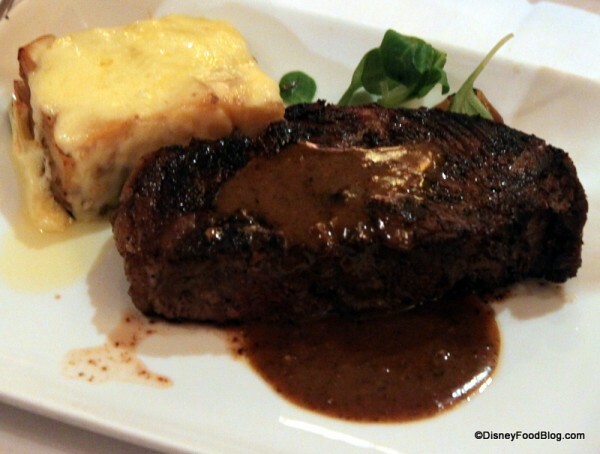 There’s no shortage of amazing steaks at Disney. Whether you’re looking for a special occasion dinner or an economic meal, you have lots of choices! 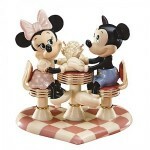 Looking for Even More Great Disney Restaurant Information? We give you even more detail about where you can find the best of the best in our 450-page DFB Guide to Walt Disney World® Dining 2014. Our guide is your ticket to planning your best Disney trip yet! 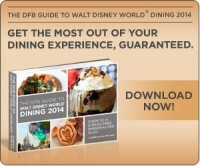 The DFB Guide to Walt Disney World® Dining 2014 is full of tips and planning tools, tested by our team of Disney Dining experts. We’ve done the research for you, so you’ll know just which spots to head to for all of your dining needs, whatever you’re craving! With sample dining itineraries, plus our “Disney Dining at a Glance” section, featuring “Where Can I Find?” options, you’ll have everything you need to plan the best vacation ever. Click here to get your copy of The DFB Guide to Walt Disney World® Dining 2014 E-book — and use code 2014 for an extra $4 discount for a limited time! Be sure to check out our Best Disney World Restaurants page for even more great Disney restaurant suggestions! I also dream of the Steak from Mama Melrose! What an unexpected suprise it was!! You missed Captain’s Grill at the Yacht Club! Had an amazing steak there in 2011!! 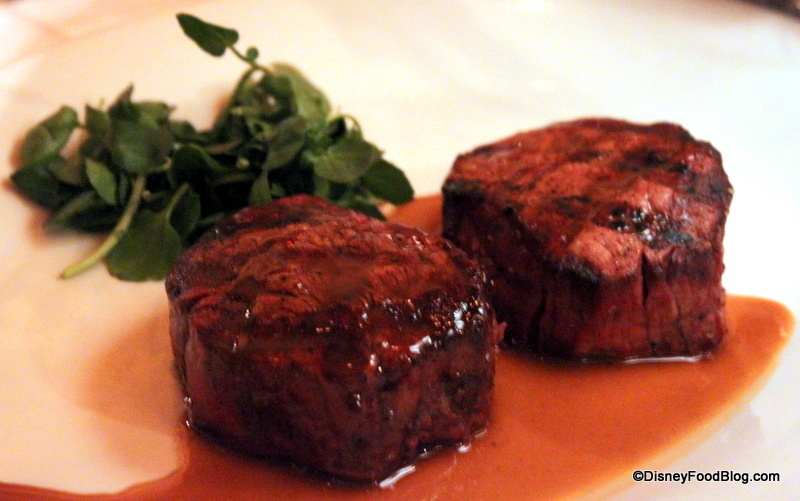 My favorite is Monsieur Paul’s filet, and the Steak Mary Anne at Shula’s is a close second. Yum! Thanks for the roundup (err… no pun intended). 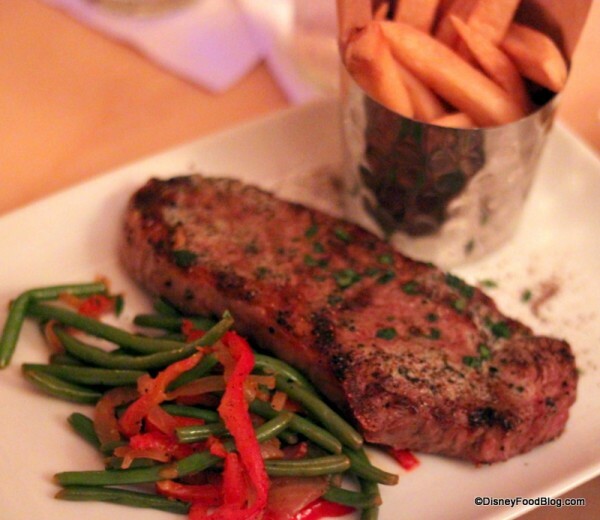 The steak at Flying Fish, our favorite signature restaurant, looks fantastic! I love the potato wrapped red snapper, but I think next time I will have to get the duo and have both. Too bad we were just there and won’t be back until 2016…hopefully they’ll still have the duo available. Next year it is on to Disneyland and Southern California! I love the Coral Reef’s steak! I’m not a fish lover so this was right up my alley!! Perfect! I can’t wait to go back to get another one! I also enjoyed California Grill, Narcoosee’s, Flying Fish Café, The Wave…looking forward to JIKO and Artist Point on the next trip. As I was reading through the article, I got more and more excited and then a little bit embarrassed because I have had each and every one of these beef meals over the years. 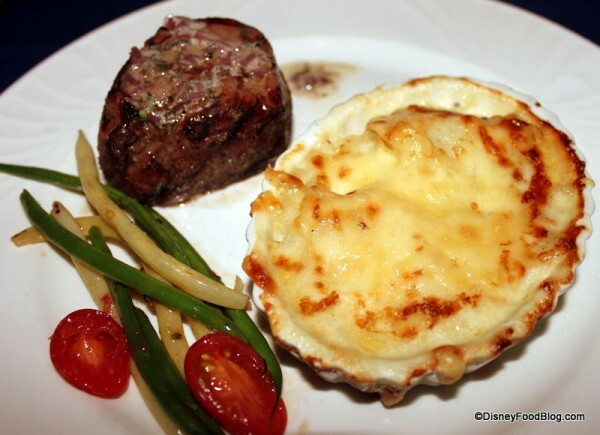 Most recently the newly renovated California Grill and on our last trip at Be Our Guest. 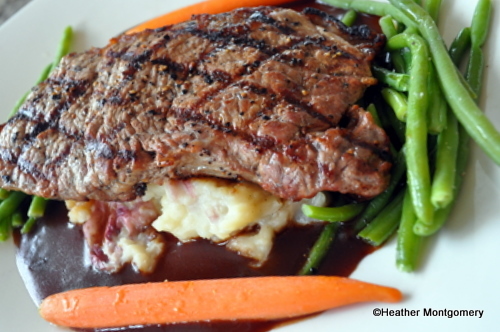 I am not a connoisseur but I do love beef, but eat it usually only on vacation or for a special occasion. 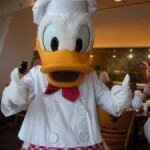 Disney is one of those places that has spectacular restaurants with some amazing Chefs. My vote for the best are Narcoossee’s at the Grand Floridian and Monsieur Paul in Epcot’s France Pavilion. Just melt in your mouth goodness. My hubby is partial to Le Cellier in Canada at EPCOT. Not that it compares with all those listed, but the steak at the Liberty Inn American Pavilion is outstanding for the price. 50 more days and I’m there. I have always been a huge fan of Yachtsman and their steaks, but boy was that ribeye a disappointment when we ate there Sunday night. The first one came out overcooked so the waiter took it back, but its replacement was so undercooked it was practically raw! We noticed similar cooking-temperature problems at several places we ate on our trip, including our beloved California Grill. 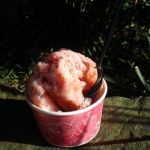 Does food quality go down during high season or something? Excellent article! I never knew there were so many steak options but now I want to try them all. It looks like all of the steaks were medium well to well done? Is that the case? As for the Prime Rib at Boatwrights, last time I was at Disney I resort hopped to Port Orleans Riverside just to get it. If you want to resort hop, I recommend going to Downtown Disney and taking the boat over to Port Orleans. You missed the filet at Alberts and Victoria’s. I confess that I don’t eat steak at WDW (dad was a butcher and gave me near impossible standards for steak so I don’t even bother any more) however I can heartily recommend RQF’s Big River Grill. It’s a forgotten little gem with decent prices and solid food. There is Shula’s and then there is everything else. No Bull & Bear?? And Liberty Tree steak?…there are few things finer than steak on a paper plate. My favorite is still the steak I had at Victoria & Albert’s. 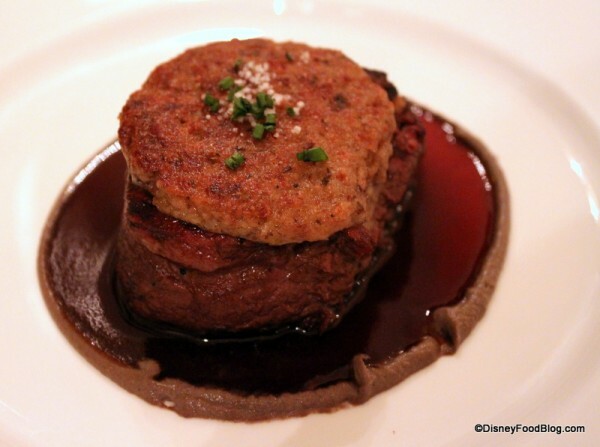 Le Cellier’s is a close second – but nothing, I don’t think, will ever beat what some call “the best beef in the world.” Om nom. We loved the steak at Kona Cafe when we were there in March so we canceled another reservation and went back to Kona in May! They changed the recipe for the steak! So disappointing! Love the pineapple bread too! 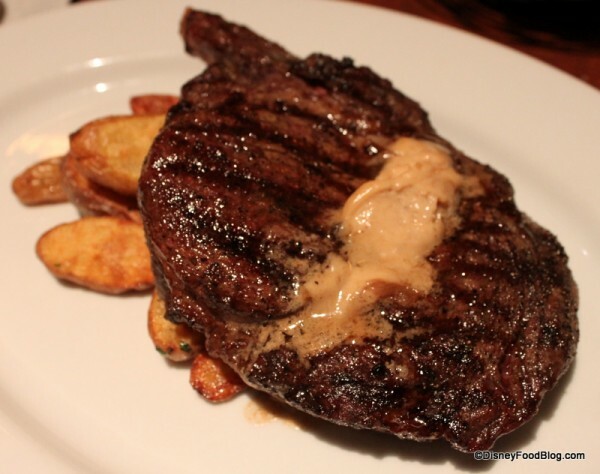 I think I will need a drool protector on my ipad if I read this article again….I’ve been lucky enough to try most of the steaks listed here, and by far the best was the mac and cheese filet at Jiko! I love Narcoossee’s-we have been twice and the food is incredible. Every single thing-and the service is wonderful! We have some open spots for our October trip, we haven’t been to Raglan Road in a while-I think that might be a fun place to try again. What about T-Rex? Their T-Bone is unreal! Add some onion rings for an appetizer and you won’t have to eat for days after! My husband and I do not miss a chance to eat at Le Cellier everytime we go to WDW. We’ve brought our kids and grandkids as well. We just went to WDS for a 2 week vacation in 2013 and did not leave without eating there. The filet is to die for and i’m not a steak eater, but it is delicious. Top that off with the crème brulee. MMMMMMMMMMMMMMMM. Can’t wait to go back to try one of the other places on your list. This will be in my food blog folder forever. Okay, can someone please help me out??? I went to Disney World in July of 2015. 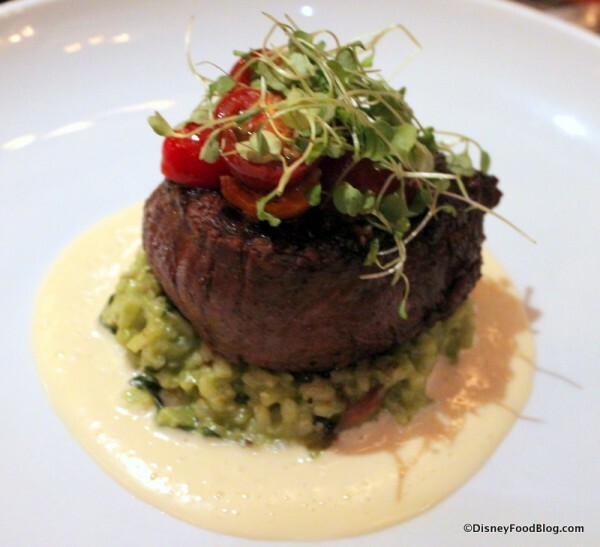 I had the filet with spinach risotto and Parmesan butter sauce at Le Cellier, but there was also this green drizzle on it, and I wanted to recreate it but I cannot for the life of me figure the recipe or what was even in it for that matter? Anyone know what I’m talking about?? In 2010 i was lucky wnough to go to wdw with my family.. can anyone remember the name of the steak at shutters that had pico de gallo on it? I would like to make this for my wife. .